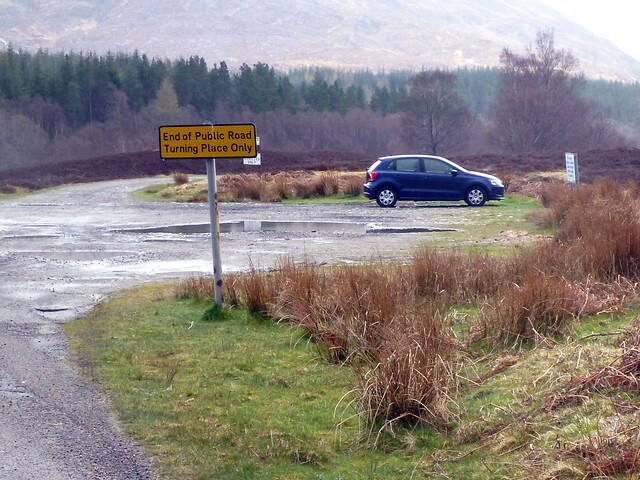 Left the house at 4.30 and up by the parking space just past Moy Lodge in time to set off at 8am. One camper van + canoe the only other inhabitants at that time, and the parking at Creag Meageidh strangely empty - maybe folk had paid attention to the weather forecast warning of high winds! Anyway, the weather was fine when we set out along the track past the strangely knobbly Binnien Shuas and saw the imposing coire of Beinn a'Chlachair ahead of us. 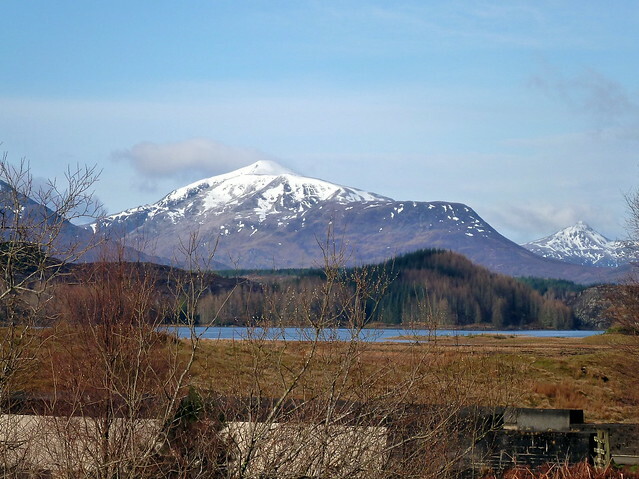 I'm busy explaining to Allison that it's really Beinn Eibhen, but she's having none of it (I'm not great at recognising hills, it must be said). 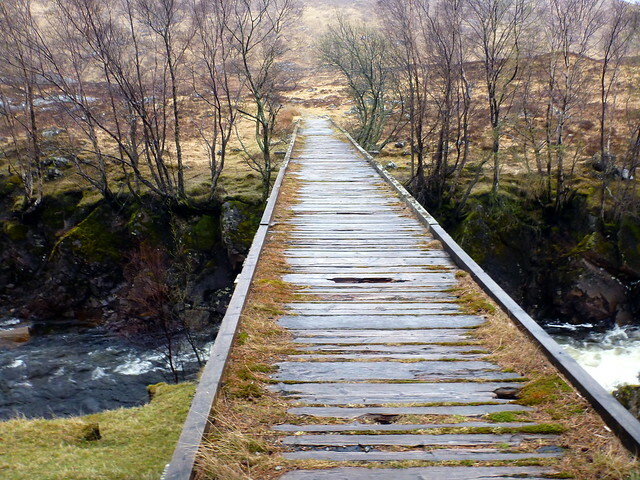 We head down towards Lochan na h-Earba with cuckoo song in the air. 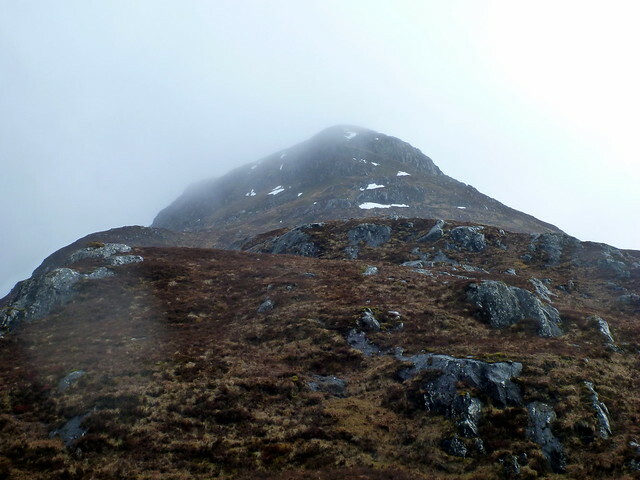 However, already we can see the mist coming down on the hilltops and the sky darkening. Today isn't going to be a day for views, it seems. 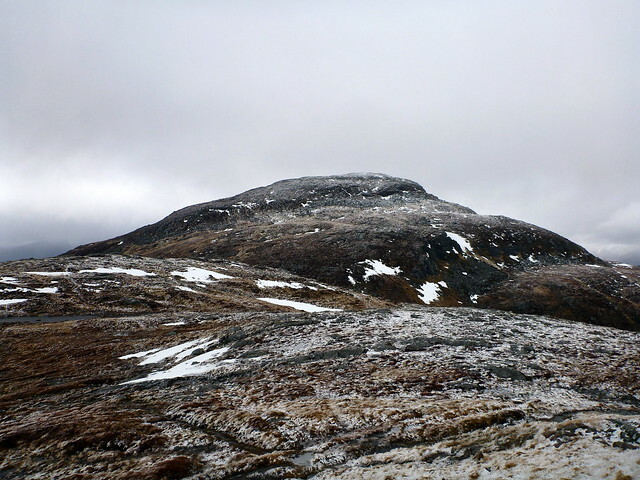 I'd decided that we'd go up Creag Pitridh first and finish up on Chlachair - which was probably fortuitous given the wind direction. 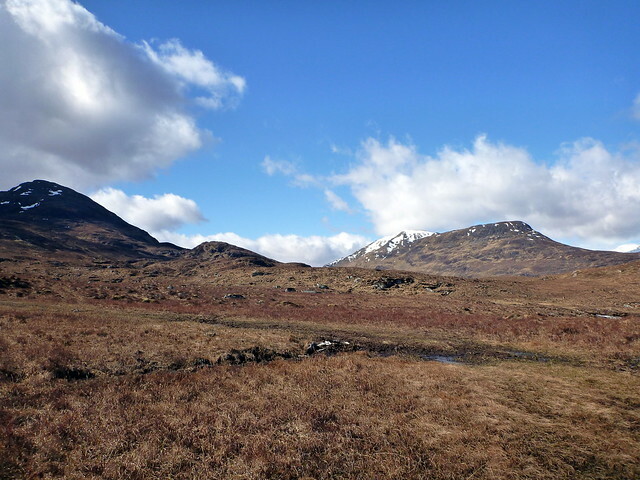 The path splits up to the left after Sgurr an t-saighdeir and is a steady paced climb, over boggy heather with new grass coming through the browns of last season and pools holding glutinous blobs of frogspawn. 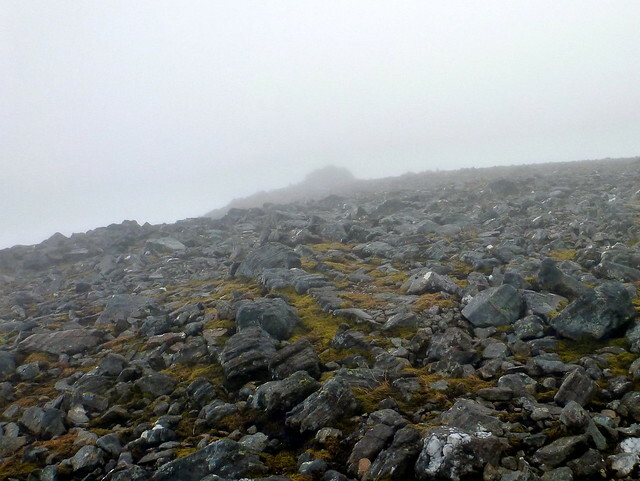 Up at around 750m the air got noiceably colder and frost predominated - we clambered over slippy rocks to the cairn. 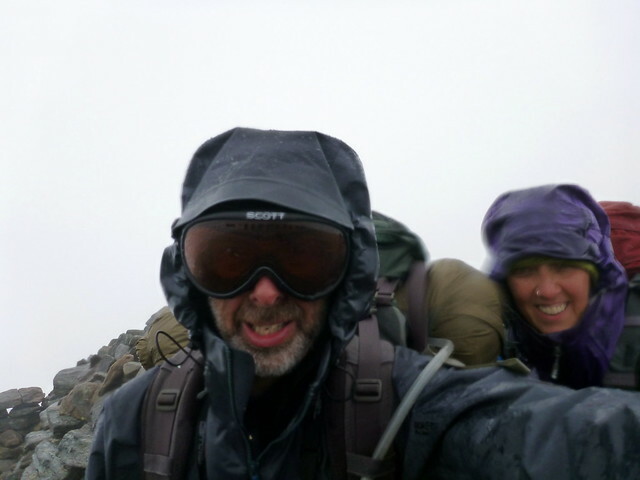 The wind had risen significantly by this point and we were buffeted about - a wee taste of what was to come. 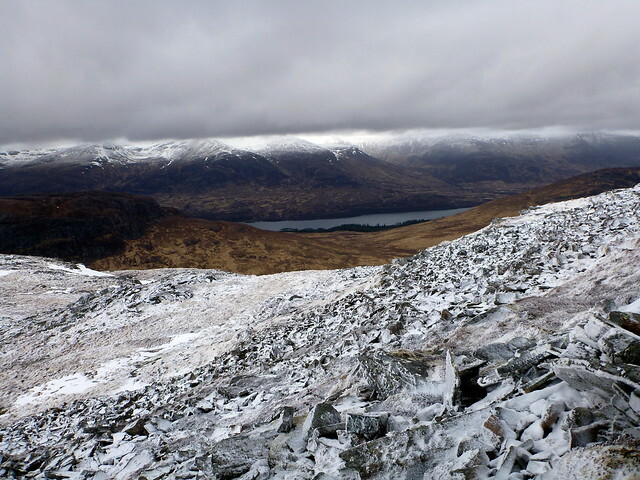 Heading down the other side of CP was tricksy - a steep stony path made treacherous by a coating of ice, with water running underneath, needin considerable care. 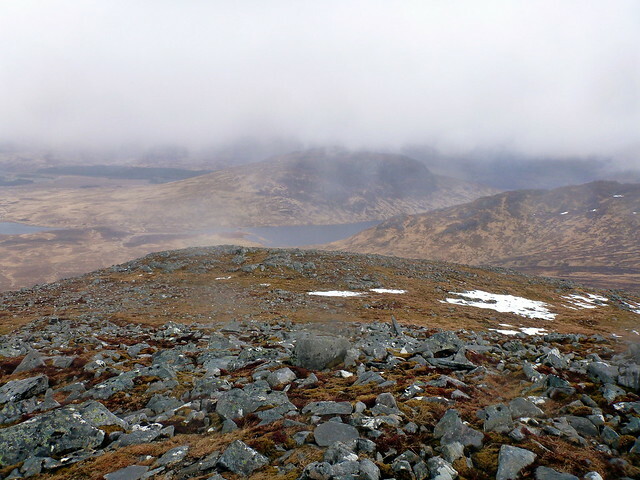 An easy path over bogs towards Geal Charn followed, with less than 100m of height lost before the short climb up GC began. 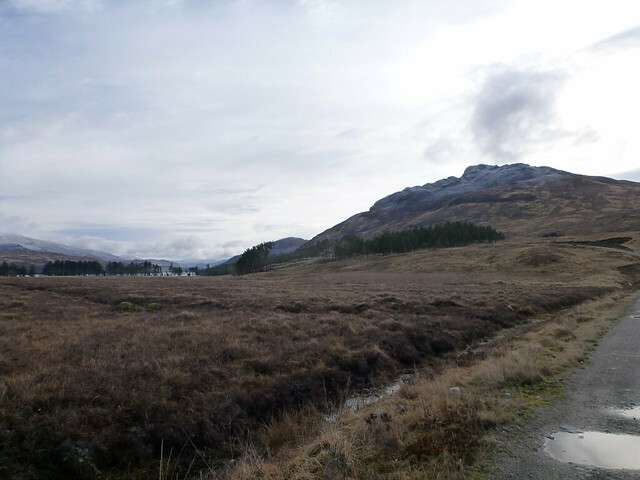 There were patches of rotten snow in between the boggy bits and the going was generally squelchy. 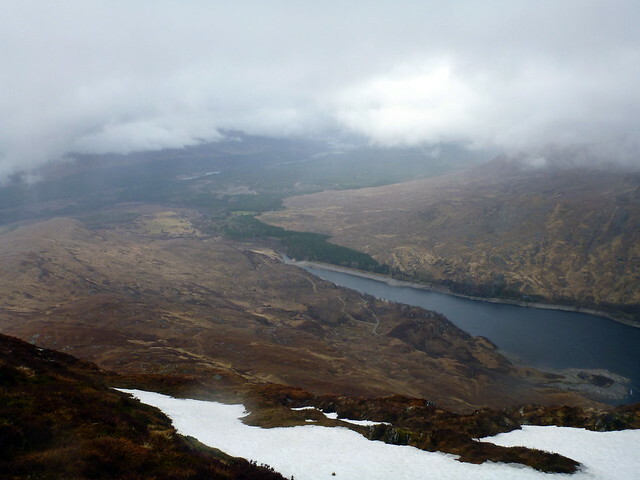 Couldn't believe how easy the trip up towards the cairn was - or at least would have been if not for the wind, which was now blasting along behind us and making traversing the loose boulders underfoot something of a challenge. 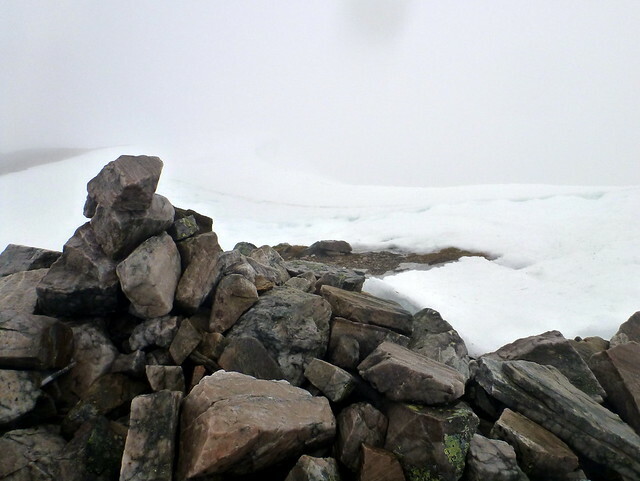 We were heading into whiteness, but soon the bizarre pimple of the summit cairn loomed out of the mist, looking like a mini-mountain on a mountain. 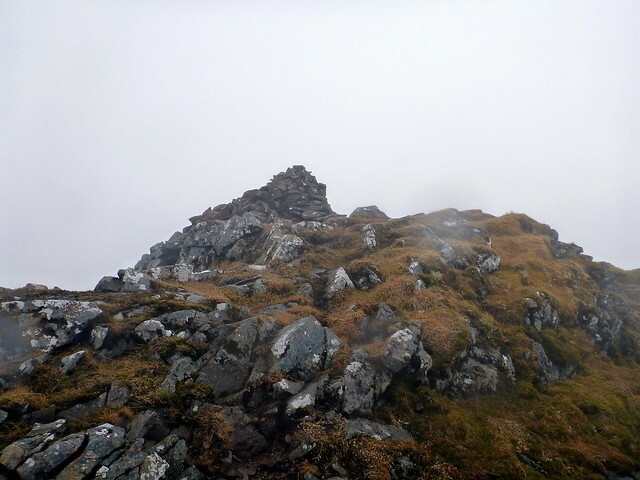 It was quite hard climbing up to the cairn because of the wind, and we sought shelter on the lee side to have some lunch by the trig point. Two down, the Stonemason's Hill to go. 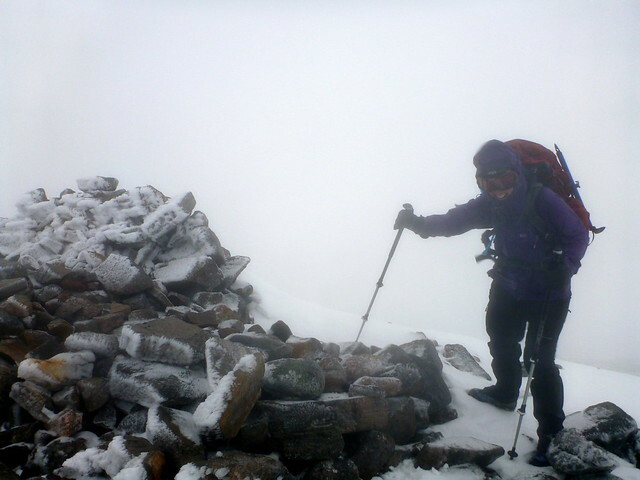 Back out into the blast of the wind and whiteness on the summit plateau before descending to Bealach Leamhain, losing far too much altitude for my liking! 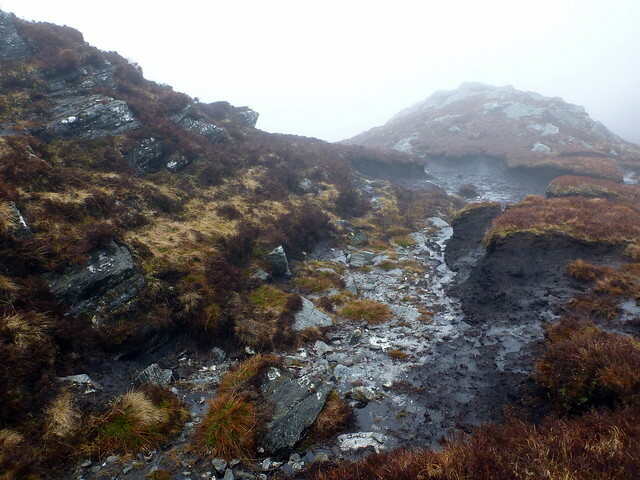 The going was quite boggy and we could see the flank of Chlachair sprawling out ahead of us on our left. 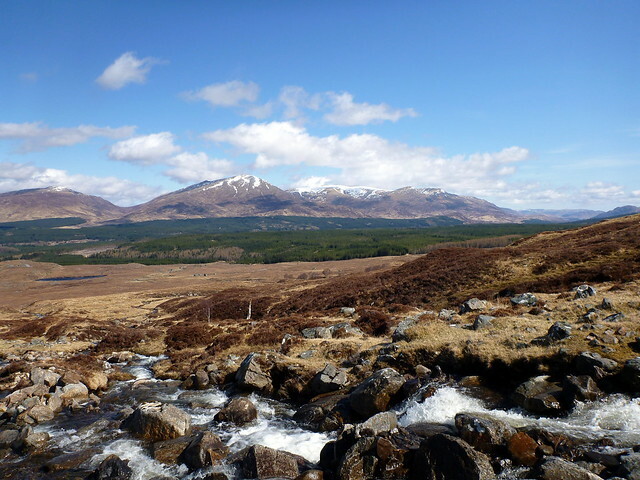 We followed the clear track to the foot of the craggy incline and enjoyed a scramble up the slippy boulders until we reached the whaleback plateau. 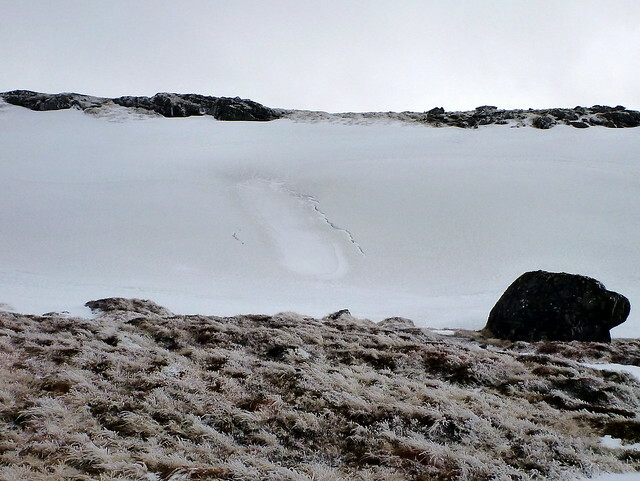 One section near the top was still covered with firm snow and I decided to fit my Kahtoola KTSs over my approach shoes (which had been doing a good job of helping my foot pain) to avoid slip risk. 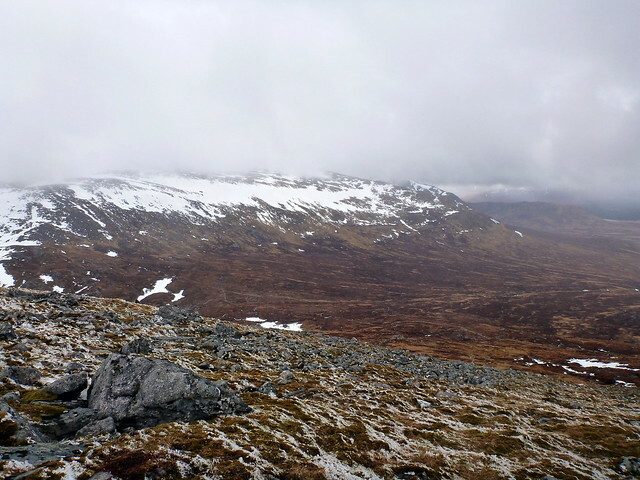 The final section round Coire Mor Chlachair was hairy in terms of wind buffeting. 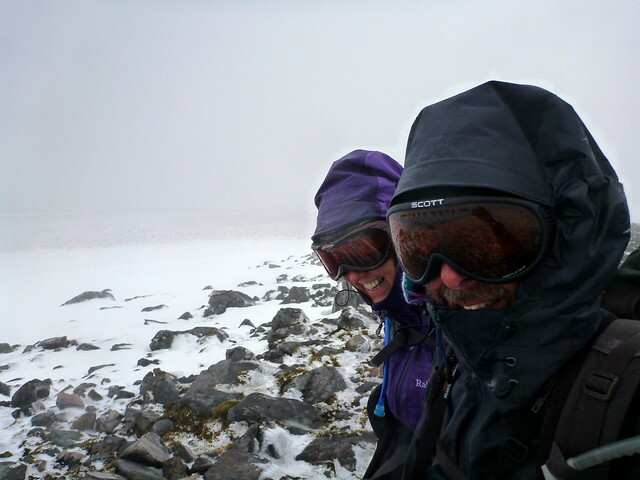 Although we were able to keep well back from the edge of the coire (which we could barely make out in the mist) it was both frightening and exhilarating to be hit with such a wind. 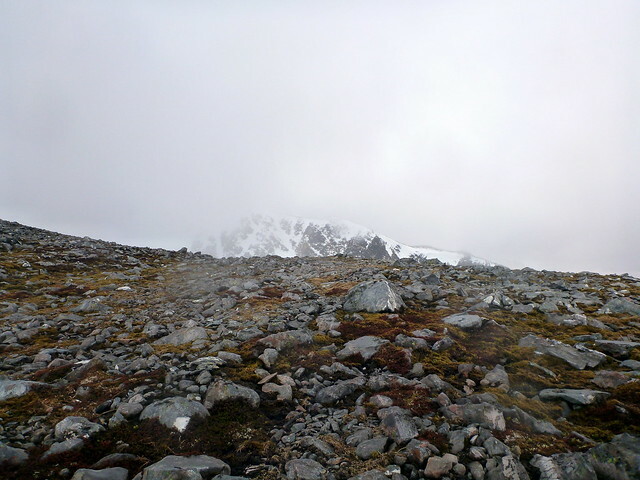 We steadily moved towards where the summit sat in the mist, finally seeing it appear above us, surrounded by a snow field. 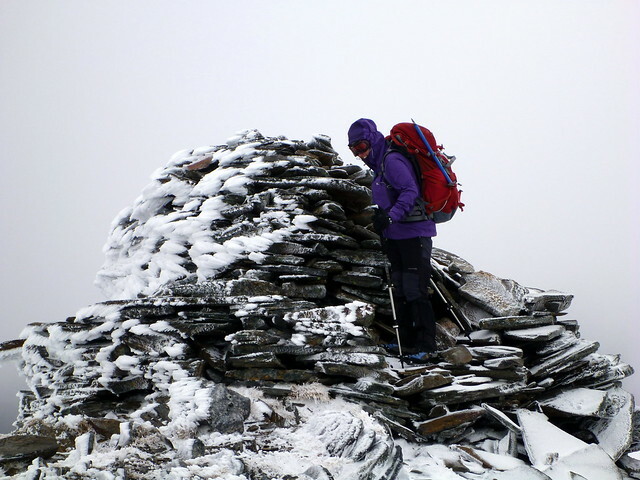 It was really difficult to stand at the summit, wind roaring in the ears and straps of packs whipping around like angry eels. Quick picture then heading back down the slope, the wind full behind us now making progress em ...interesting. 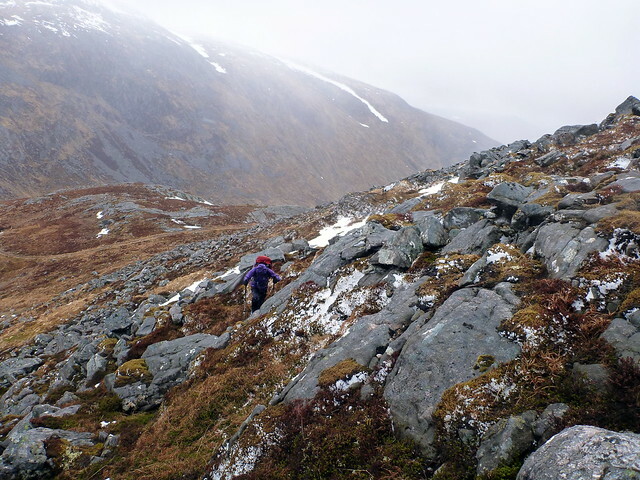 we followed the edge of the coire at a respectful distance then headed down the rough bouldery path towards Allt Coire Pitridh. We laughed each time the wind caught one or other of us and blew us sprawling - fortunately avoiding injury. 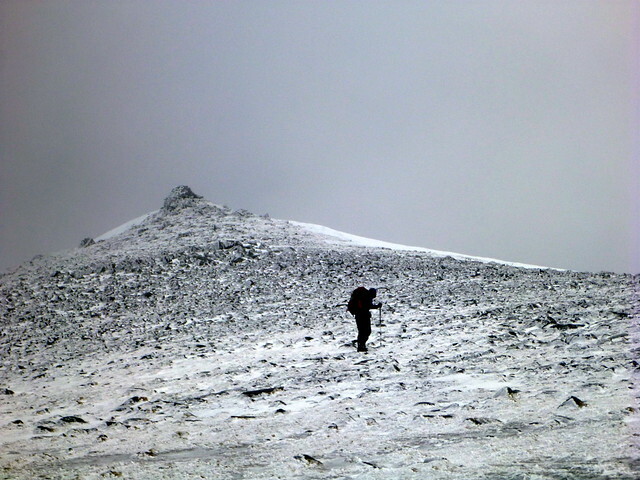 Eventually we reached flatter ground and the intensity of the wind diminished. 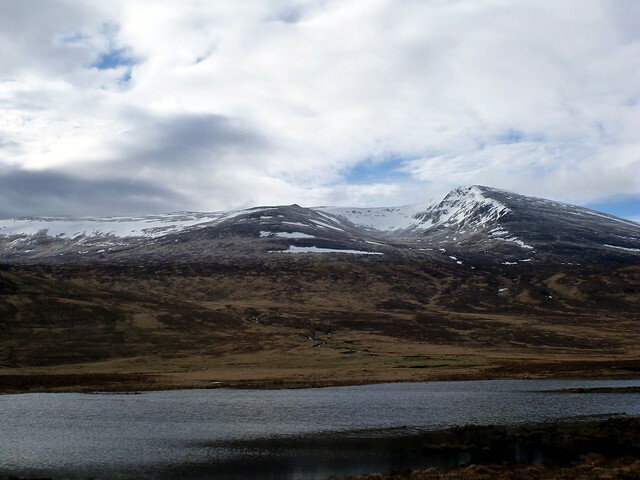 We headed back towards the Lochan, glad to have visibility of our objective returned. Hitting the landrover track was a delight after the rocky and boggy terrain and we made good progress back towards the car, looking around for suitable camping sites in the last km or so and eventually finding one behind a hillock alongside Abhainn Ghuilbhain where we thought we'd get at least some shelter from the wind overnight. 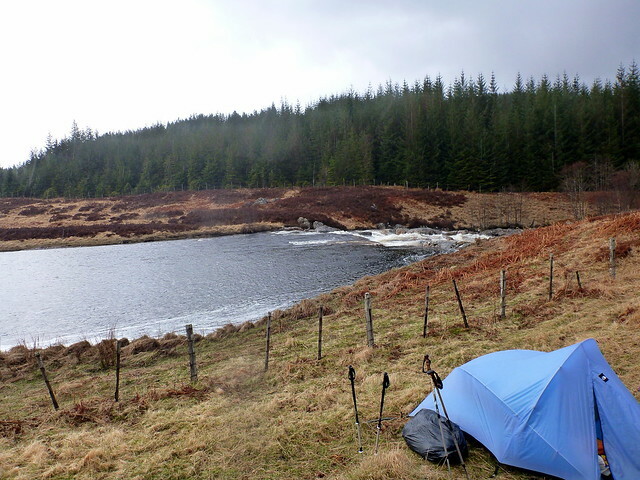 returned to the car to collect the tent etc and pitched in the rain with the roaring of the river in our ears. Fortunately the weather didn't deteriorate overnight and the tent stayed in place - I was greatful for having our ice-axes to act as additional tent pegs however. Sunday morning arrived with low clouds and more rain, but cleared after breakfast and the sun was shining as we drove to Fersit for part two of our adventure. 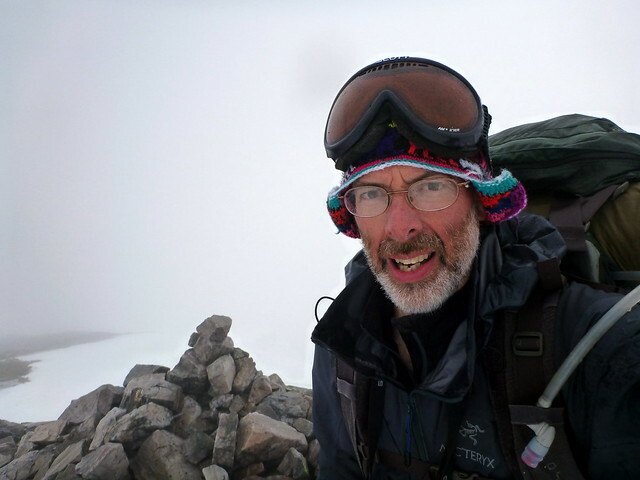 I knew that the forecast was for high winds again today but calmer weather on Monday and decided we'd do the Loch Treig circuit in reverse direction to Dooterbang's trip, taking in Stob Coire Sgriodain and Chno Dearg first and finishing on the Easian ridge, which should be less hazardous in lighter wind. For a moment I did think we should be ambitious and try to do the whole circuit in one day - it was only 31km or something - which would mean that we could do the other pair of hills in this area that needed done, Beinn aChaorainn and Beinn Teallach, which would allow me to bring up my 100 this weekend. 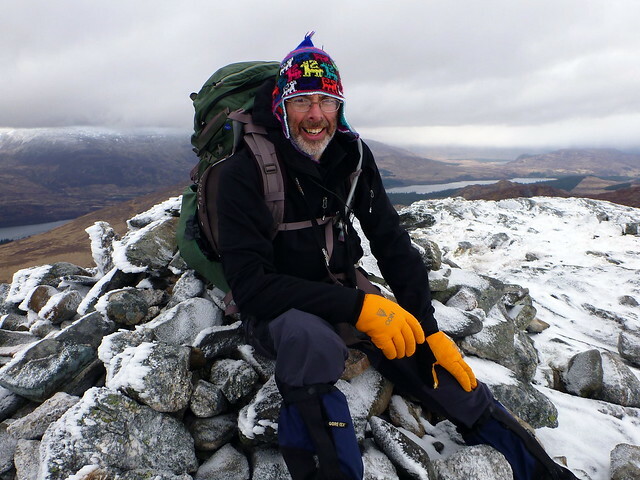 This would mean walking without full packs and having to complete the Treig circuit as I knew if we walked with full kit we wouldn't manage the distance, especially as we were starting out at the incredibly relaxed time of 10am. 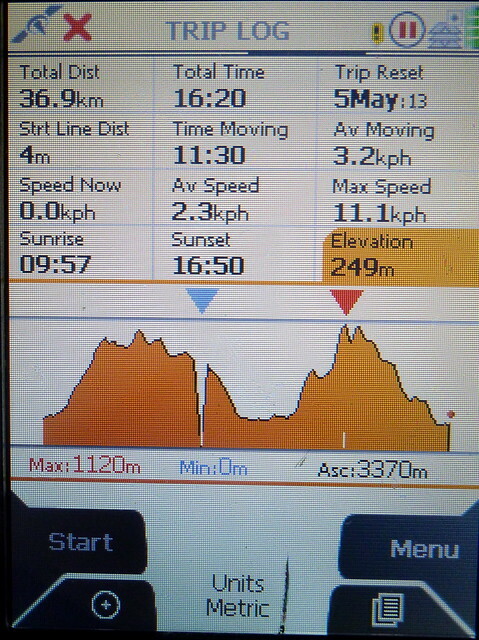 But sense prevailed and we set off "fully loaded" with the expectation of doing the circuit over 2 days. 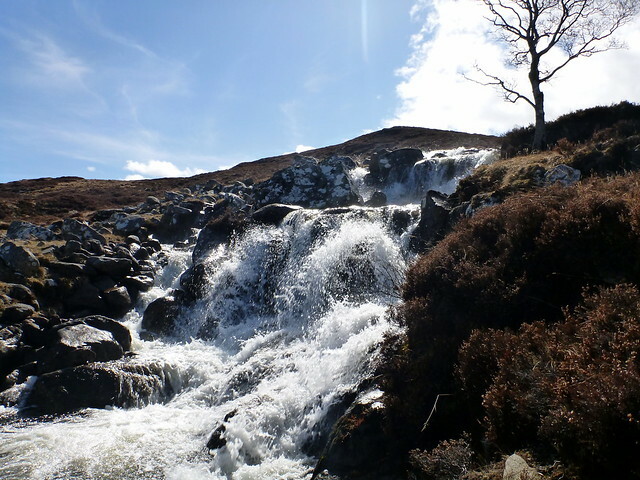 Walking through Fersit in the warm sun was lovely, bird song, barking dogs and a few other folk heading out to the hills. 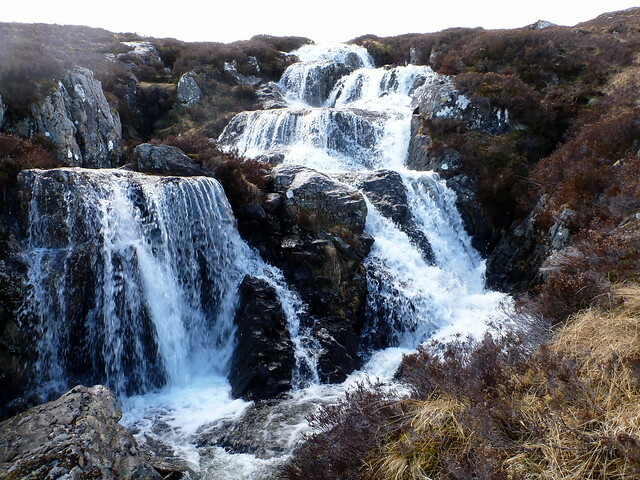 Going was very wet underfoot and we could see numerous waterfalls corruscating on the hillside ahead of us. 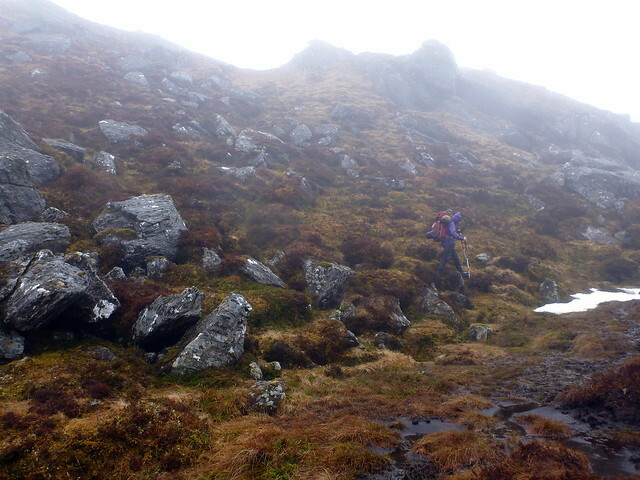 Easy scrambling up the rocky face of Sron na Garbh bheinne with the clag coming down and the rain starting. Oh yes, and the winds blowing up again. At least it was a milder day than yesterday. 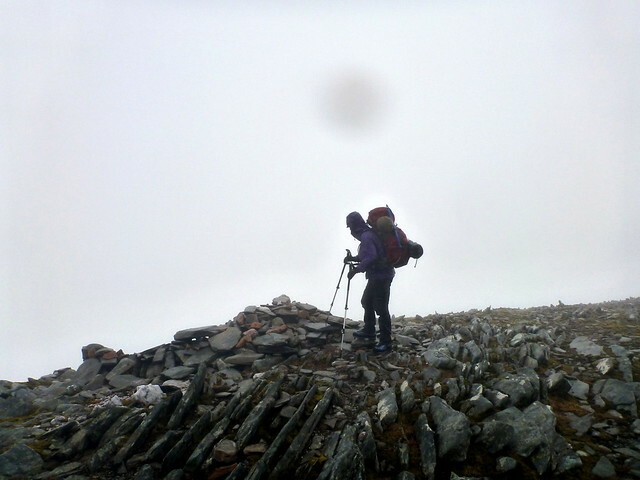 We pressed ahead to the top of Stob Coire Sgriodean taking care in the wind as we met the summit cairn, with a drop on the right side. 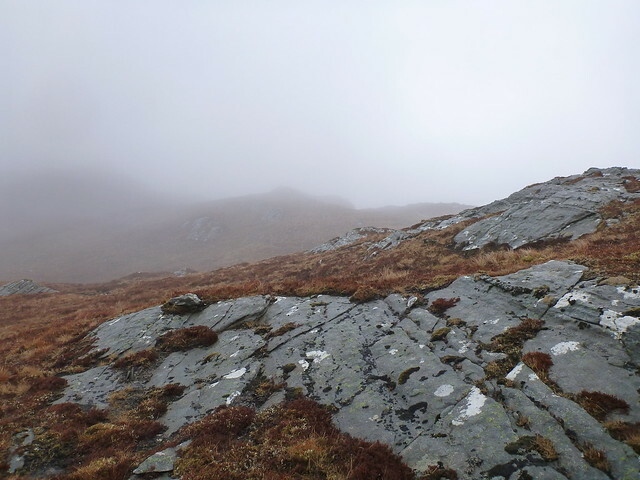 No conditions to linger here, we followed a set of footprints down towards the invisible Chno Dearg, mist and rain making progress slow and quite miserable. 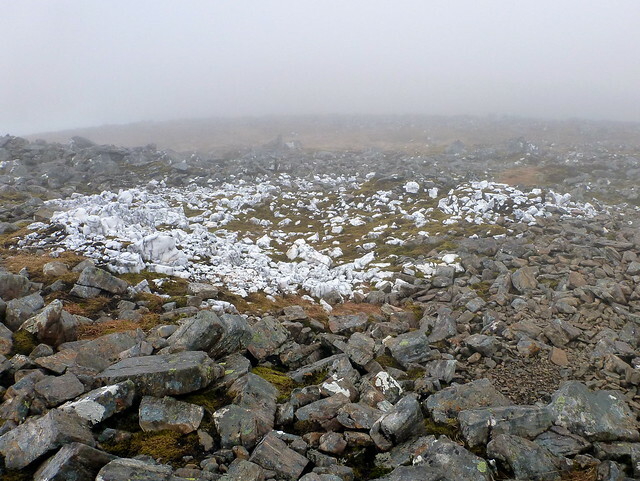 Did pass a strange collection of white quartz rocks amongst the dark coloured rocks of the hill. Stopped for something to eat in the wet, belatedly fitted waterproof trousers, which at least kept the wind chill factor manageable, even if trousers had already become rather wet. 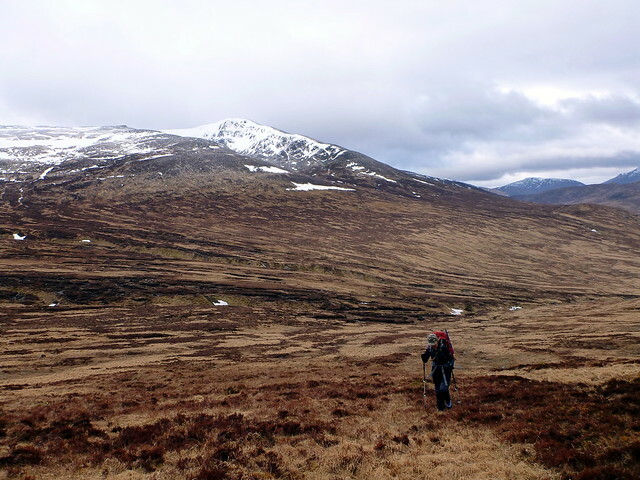 After an interminable time we started to ascend the final pull towards the top of Chno Dearg - with no visibily it was disappointing not to be able to look back over to the Alder hills we fondly remembered from Easter. Ach well. 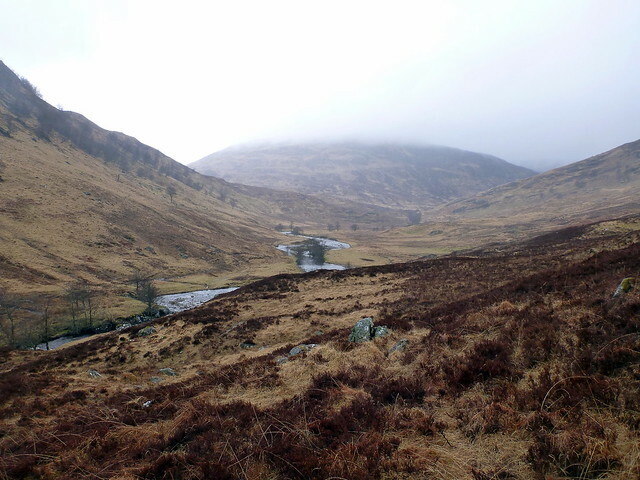 We were now going to head down to the base of Loch Treig, crossing Meall Garbh and Garbh Beinn, but a liking for bumslides made me head off too quickly down the slopes of coire nan cnamh - realising that the slope was somewhat steeper than i had imagined when i could see enough through the mist, we hastily headed back up to the rim of the coire and headed along to meall garbh. The next section seemed to go on for ever, not helped by the GPS battery dying and sending me off course before it did so on the misty moor (hence the abrupt dip in the profile picture). 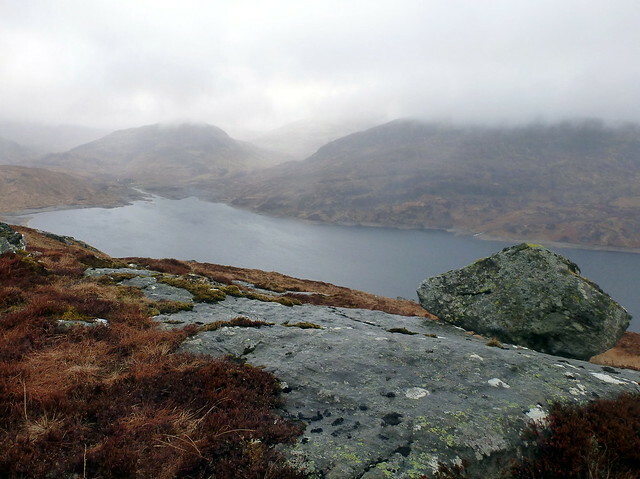 We ended up just heading for the road once we could finally see Loch Treig through the mist with ankles sore from contouring round the hillside. 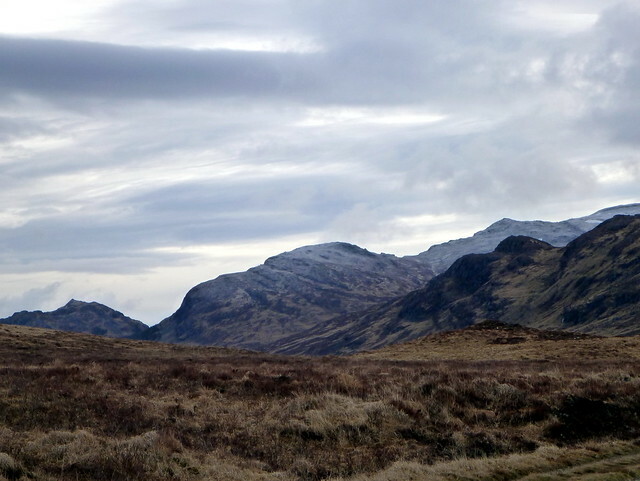 We disturbed an antlerless stag who glanced at us cooly before heading off down the slopes. 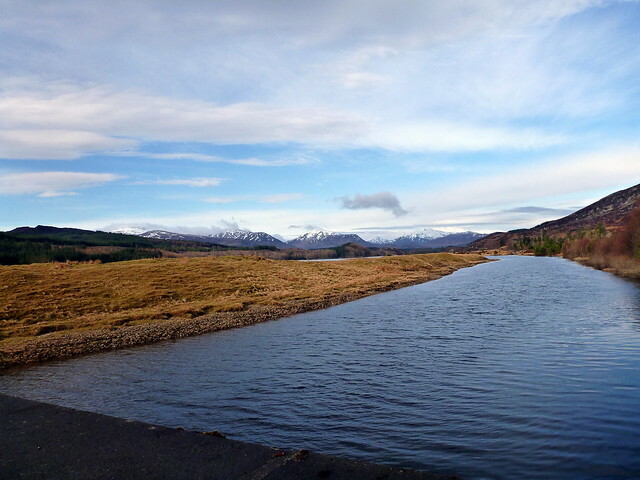 We could see tomorrows hills across the other side of the loch, which looked reassuringly free of snow (as I'd advised Allison she could leave her crampons in the car). Finally we got onto the track, the rain beating heavily against us now. 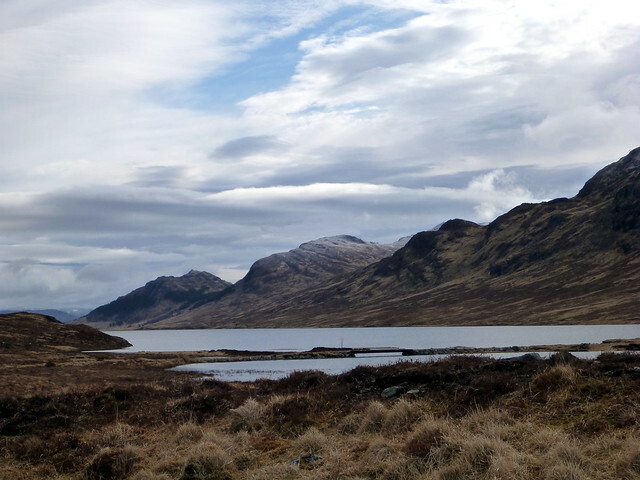 We passed a solitary boat moored in the middle of the loch and decided to head round towards Creaguaineach Lodge to find a campsite. Our meal was more meagre than last night's though we did share a mini-bottle of wine that i'd lugged along. 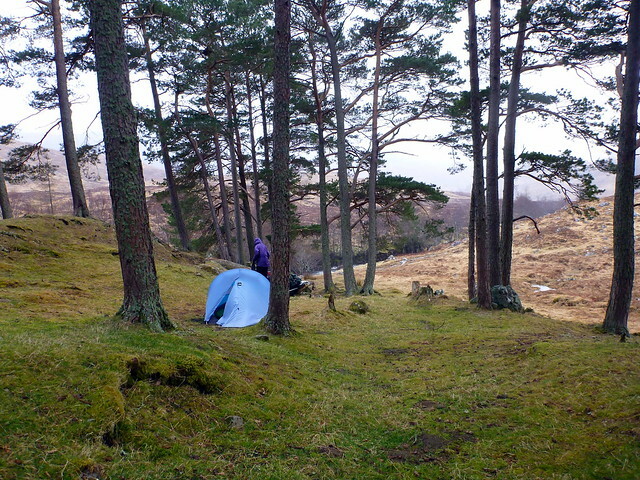 Off to sleep with the rain drumming and the wind battering the tent. Monday morning - the forecast for England had been 22C and beautiful weather - unfortunately not for us - we woke to rain and low clouds and decided to leave getting up for a bit to see if the rain would lessen. By about 9am it had reduced to a sullen drizzle and we ate porridge sitting on a wet log, me with a headache and feeling sick. I wondered if I'd "caught something" from the stream water I'd drunk the day before, but in hindsight I think it was dehydration from not taking enough fluids the previous day. Anyway, in damp clothes and with a heavier sack due to wet tent, clothes and damp sleeping bag we set off along the Allt na Lairige. DB's route showed a river fording further along than the bridge, and I stupidly headed for this, not really comprehending that with all the recent rain and snow melt there would be no way the ford was passable... eventually this did dawn on me and with heavy legs we headed along the way we'd come back towards the wee bridge. 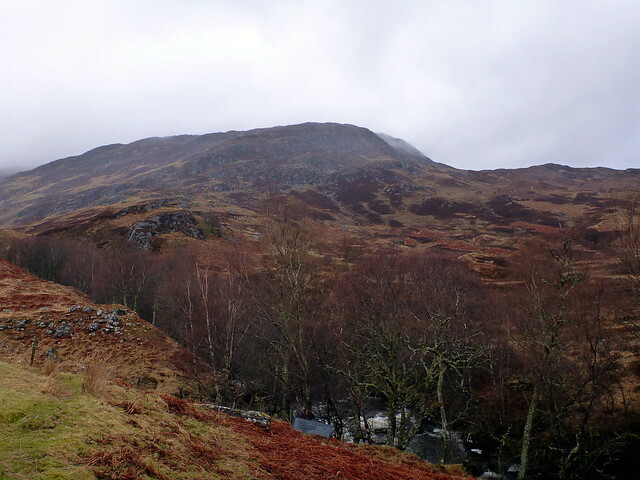 The path took us along the hillside high over the river and was steep, narrow and slippy. 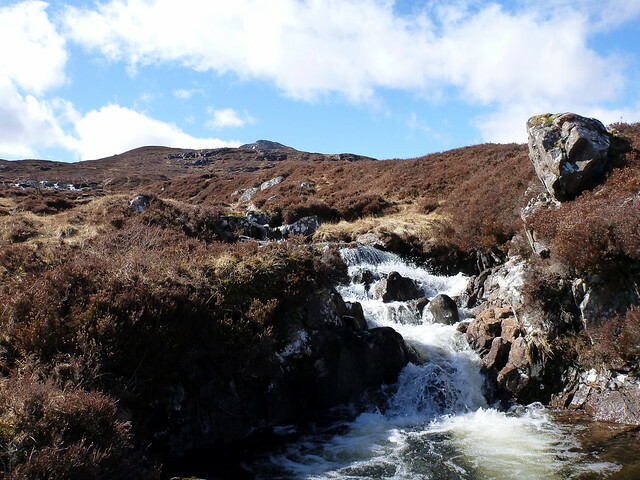 We headed up the very steep hillside towards Creagan a Chais, I had to stop for a drink by an icy stream and slowly the feeling of nausea left me. 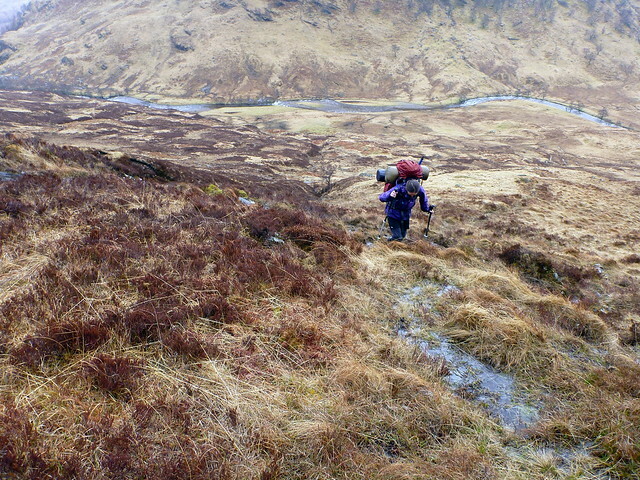 It was tough work on the ascent, but finally we got to the boggy plateau behind the hill. In the mist and rain I could see nothing of the Easian hills, but could sense their brooding presence to our left. Stopping for an early lunch to boost our spirits and energy levels we had another look at the map. 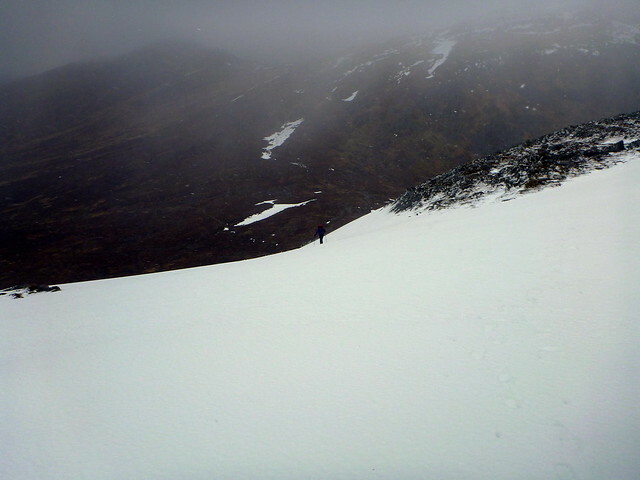 God - that's a steep route up the coire! 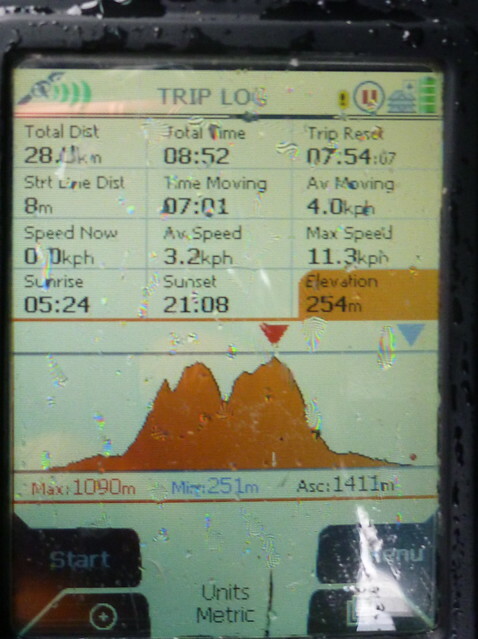 As this was the third day's route I was guilty of having paid less attention to the practicalities of what was involved than on the first two days - i was regretting doing the hills this way round by now! 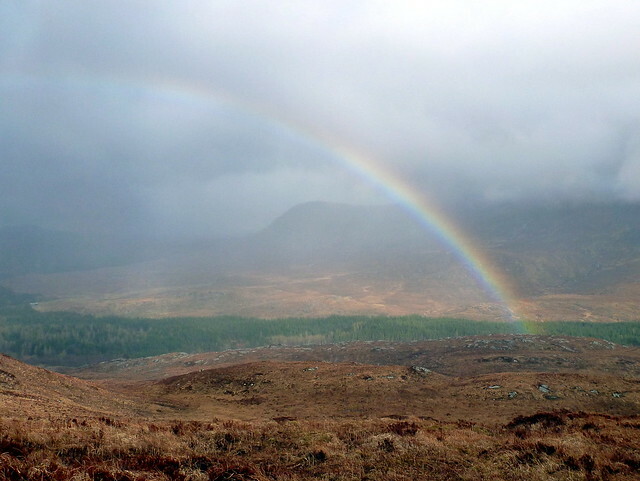 We did think about going up the shoulder of irlick chaoile instead but it looked far too narrow for comfort. 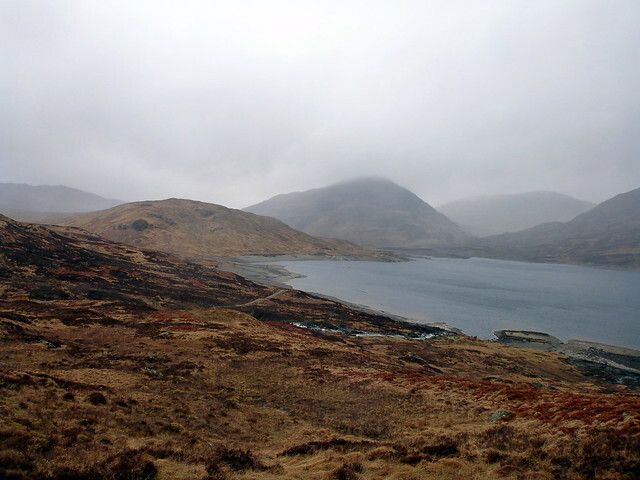 And really there was no other option unless we gave up on the hills and trekked down to the shores of Loch Treig. I was feeling a bit better by now, and we pressed on. It was going to be 500m of hell - very steep grassy scree with heavy sacks on day three legs was not a recipe for pleasure. But, nothing for it, the only way was up. Aware of the risk of loosening scree I got Allison to walk in front of me and I kept close enough behind her to be able to dodge any loose stuff. 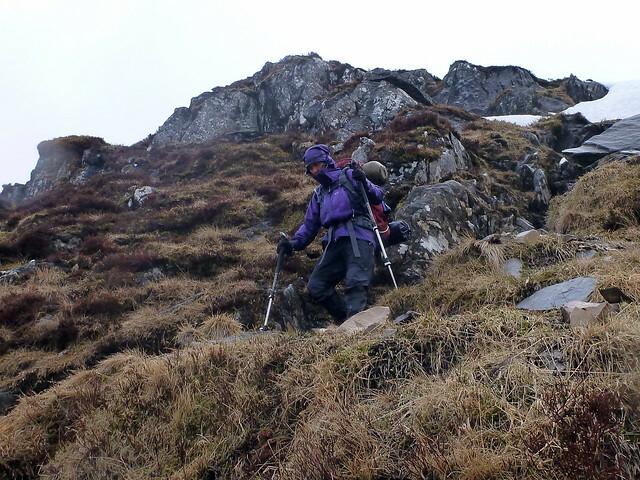 This was really hard going - slippy grass and rocks that gave way - many slips and the walking poles were invaluable. Was a case of counting steps up and every so often checking the altitude gained on the GPS to give heart - 850m, 900, 1000 and so forth. 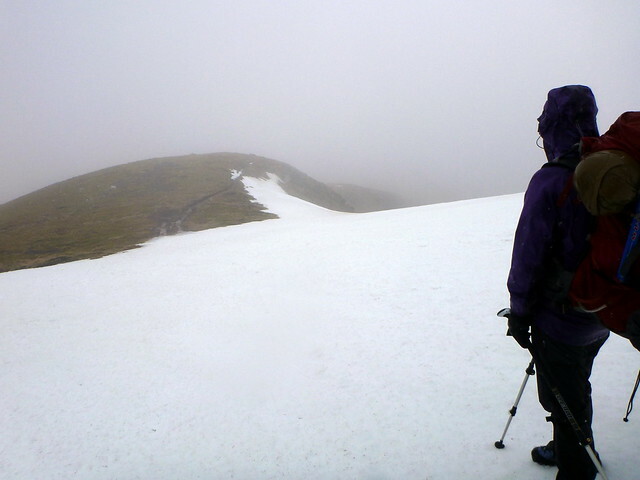 By the time we got to about 70m from the top we hit a bank of snow that stretched up to the summit. Wet snow. Oh dear. Trying to keep to the rocky bits that broke through the surface of the snow intermittently we headed along the last 100m or so towards the summit, at about 40m from the top ridge. 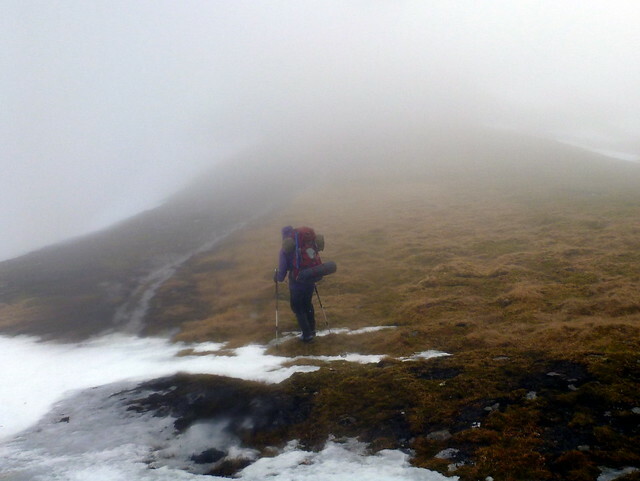 It was still cloaked in mist, but suddenly the mist lifted and to my horror I saw a 20m cornice looming over us. Given the rotten condition of the snow this was alarming indeed. Keeping to the boulders where possible and making as much haste as we could to get out of the danger zone we finally got the the path up the last few metres to the summit. It was very narrow at the top, with a yawning drop heavily corniced straight ahead of us. 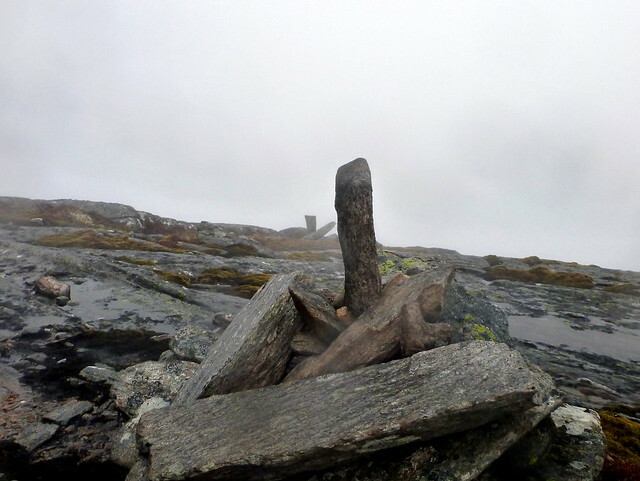 Shaken, I made for the cairn, shouted to Allison to keep left and took a quick snap before getting off the summit and heading down the well marked path towards Stob aChoire Mheadhoin. 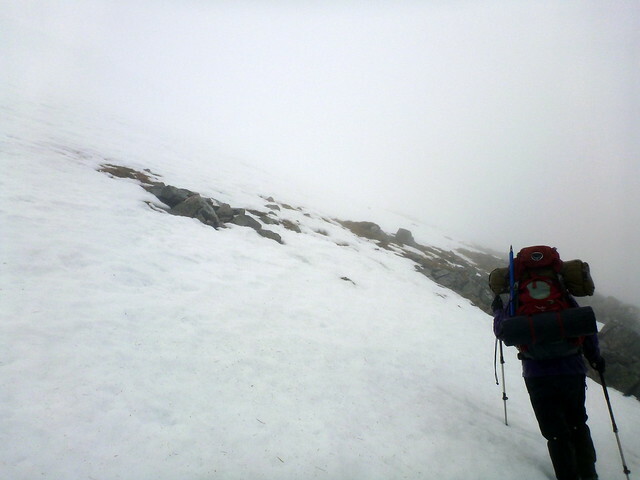 That had not been a pleasant experience, knowing that there was no escape route if the cornice over us had slipped at that time - and having no way of seeing there was cornice there until we were right under it for the mist. 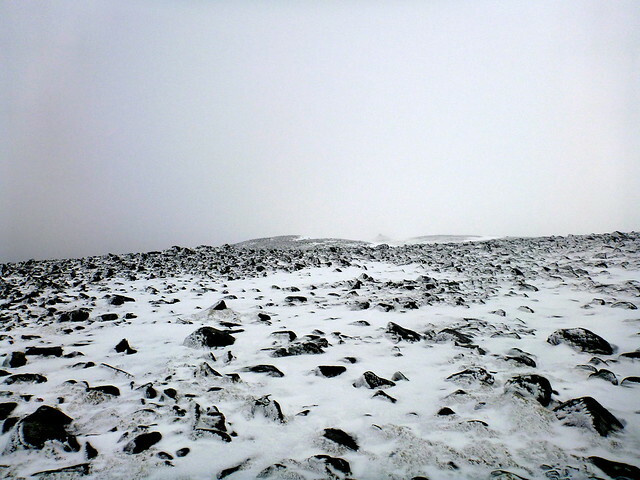 The trek to SaCM was over a rocky but basically easy to follow path which occasionally disappeared under snow. Soon we'd reached the top and I reflected how much easier the hills were if you did them in the other direction! 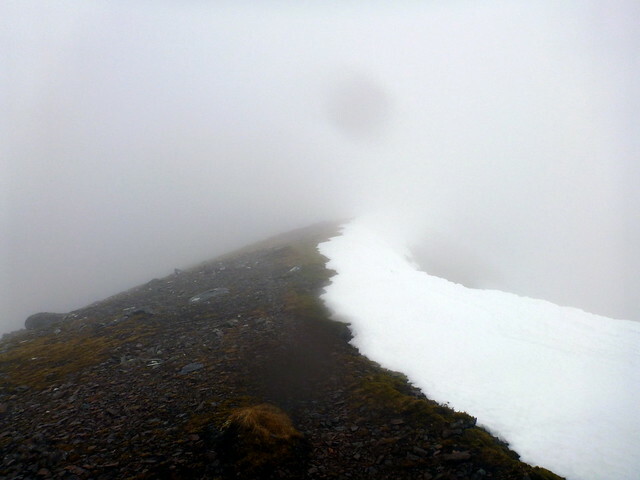 The path from the summit led over more snow banks and i was uneasy, again worrying about avalanche risk. 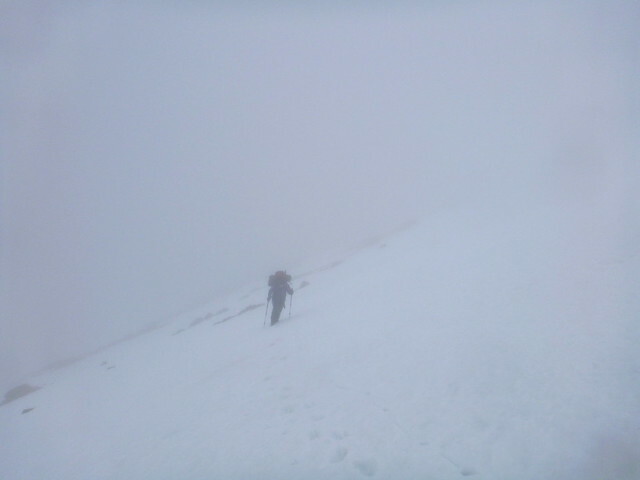 The clag was still down, which didn't help hiding any visual reassurance of what was ahead of us. 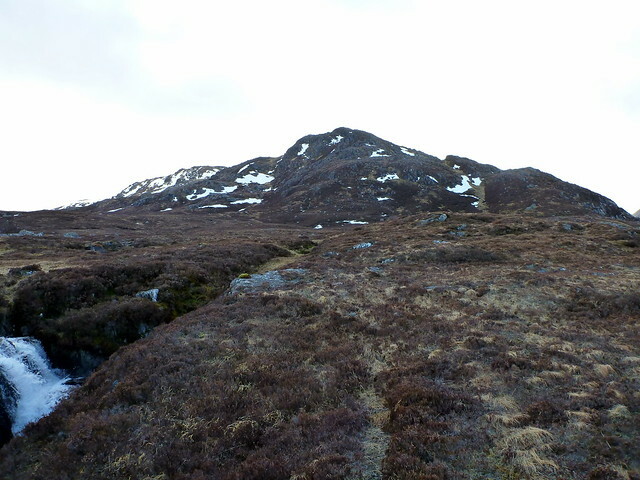 Every so often we'd see a coire edge as the path snaked around Coires Meadhon, Aluinn and Shomhairle - it would have been impressive if we'd had a view of the ridge. 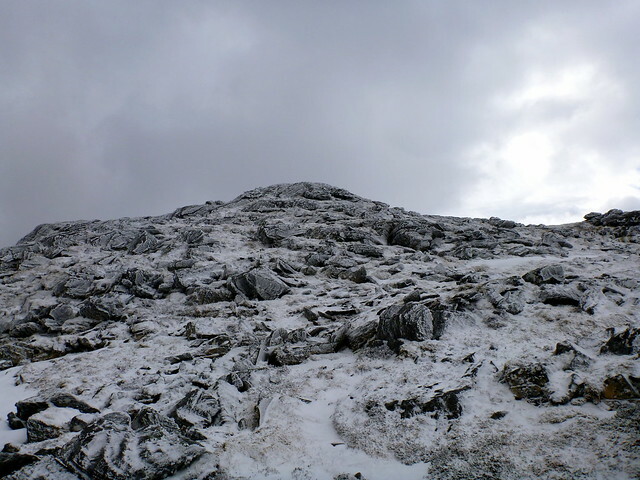 A long high altitude trudge followed until we reached the scarp of Meall Cian Dearg. DBs route indicated we should head straight down a grassy slope which looked impossibly steep, particularly in wet conditions with heavy packs, and I cross-checked with the WH route which indicated another path to the west of DB's one. We crawled back up the hillside and trekked round to find this very steep stony path winding down the face of the hillside. Not a path I'd fancy being on with peaple climbing above me, given the ease of loosening large chunks of scree. But there was no-one else around today. 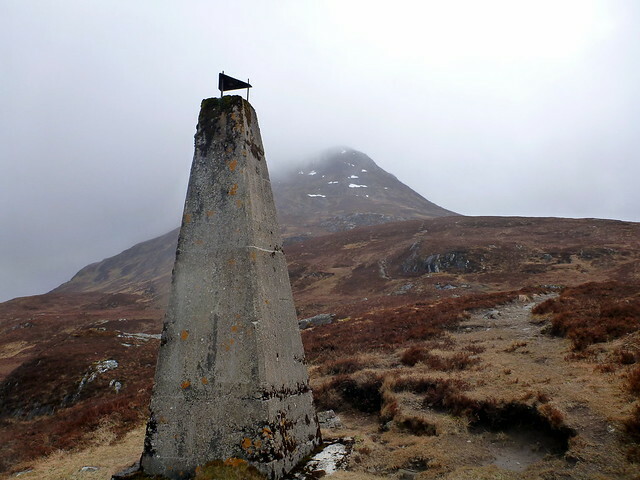 After some slips and scrapes we got to the bottom of the hill and faced a very wet and marshy traipse over boggy hillside, passing a strange pillar looking like an elongated trig point. I lost count of the number of times I slipped and fell in the marsh - jarring my back and getting my trousers very wet and muddy indeed. We were both walking with feet inside our own personal swimming pools and it's great the impunity that truly soaked feet gives you to walk right through bogs rather than worrying about skirting round them! 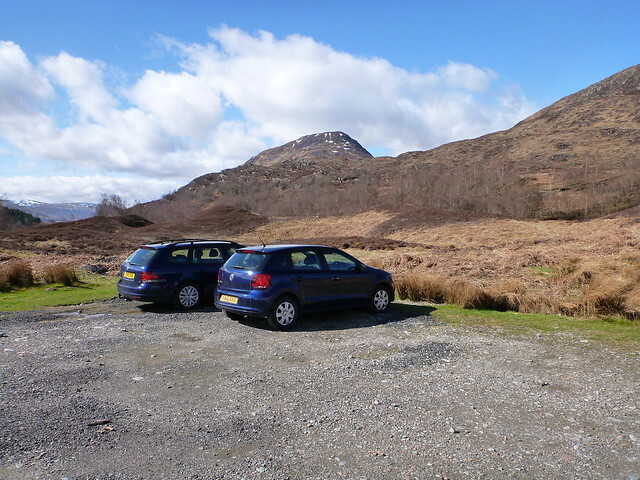 Eventually we got back to the car park at Fersit and the welcome sight of my wee car sitting there, promising dryness and warmth. By this time it is around 6pm, much later than I'd ever imagined it would take us to get back. I admit I seriously underestimated this pair of hills, particularly the steepness of the ascent from our direction up Stob Coire Easian. Some hills - like last thursday's Tolmount - are achieved easily, some only after a struggle and the Easian ridge approached from the south was definately a struggle! but we made it - albeit with tired legs. We headed off down the road on a lovely still evening, stopping for a well earned curry in Pitlochry and eventually getting home after 11pm - less than 9 hours til work - whoopee!! great report, really enjoyed reading that. 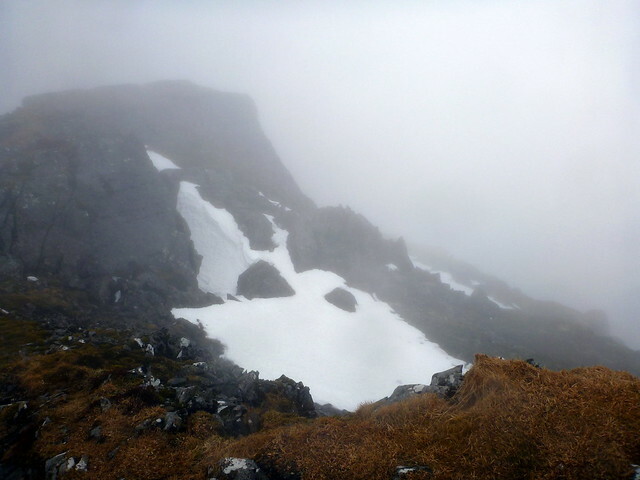 not least as i was fairly close by on saturday (grey corries) and sunday (meagaidh circuit) experiencing exactly the same weather and on the sunday exactly the same 'swimming pool' boots. 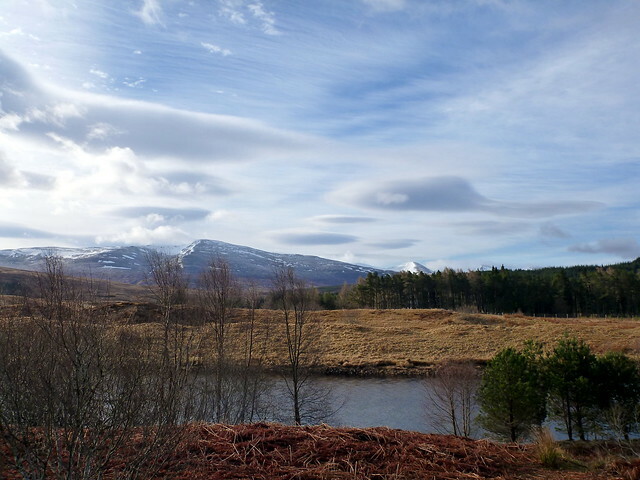 Another weasel epic to make me jealous - but not of your weather, well done for completing your planned expedition. Oh lordy what a journey! What a report! Surely a contender for WROTM!